K150 is a low-cost high-performance PIC programmer, supporting many popular PIC chips. Allows reading, writing, encryption, and uses high-speed USB communication for fast programming ( speed average PICSTART + 3-5 times ). 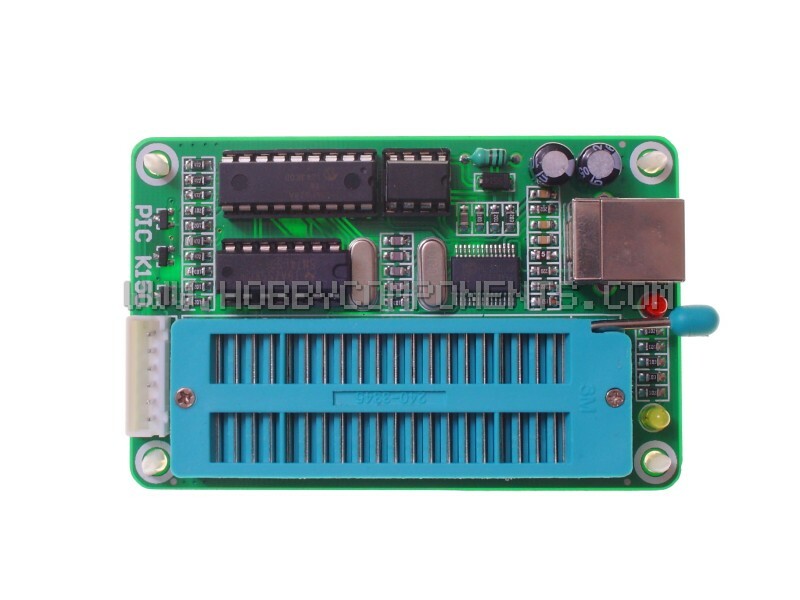 Fully automatic programming checksum ; equipped with 40pin DIP programming ZIF socket, direct programming of 8pin-40pinDIP chip; 8pin-40 pin chip as well as via the onboard the ICSP interface. Popular download software available; software-compatible the Windows98 and Windows2000/NT, Windows XP/windows7 operating system. Socketed chips for easy replacement and upgrade. Support many popular PIC chips, programming, read, encryption and other features! No external power supply required, communication and power by supplied USB cable. Much faster programming rate than PICSTARTPLUS . 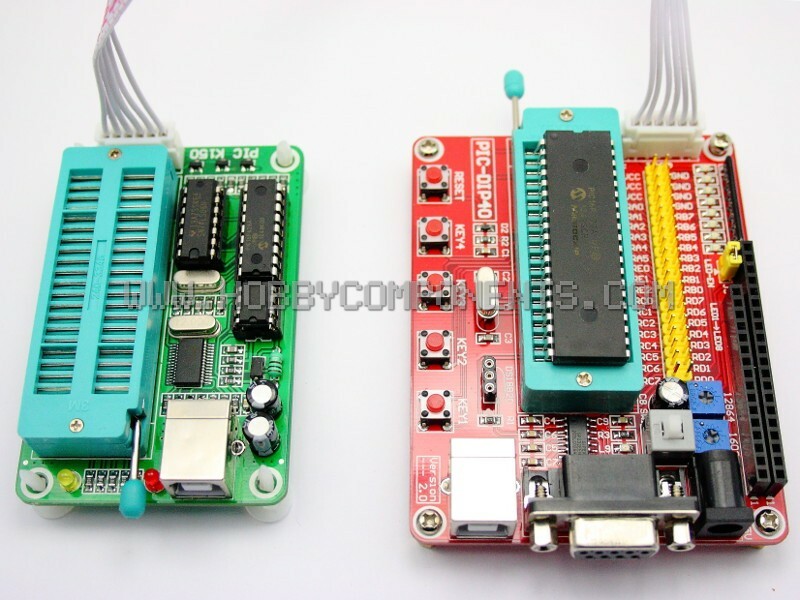 With 40pin ZIF socket, 8-pin to 40 pin PIC microcontroller chip can easily be programmed. 8 pin 40 pin-board Allows programming of PIC device whilst in circuit via its ICSP and included cable. UPDATE: For Windows 8/8.1/10 users we have a tested and working driver. However this is an unofficial driver version and although we have tested and confirmed it to work a a Windows 10 system we provide no warranties or guarantees that it will work with your system. The driver can version found towards the bottom of this post. We value your feedback on this fixed driver. Windows drivers for windows XP/7 can be downloaded here. 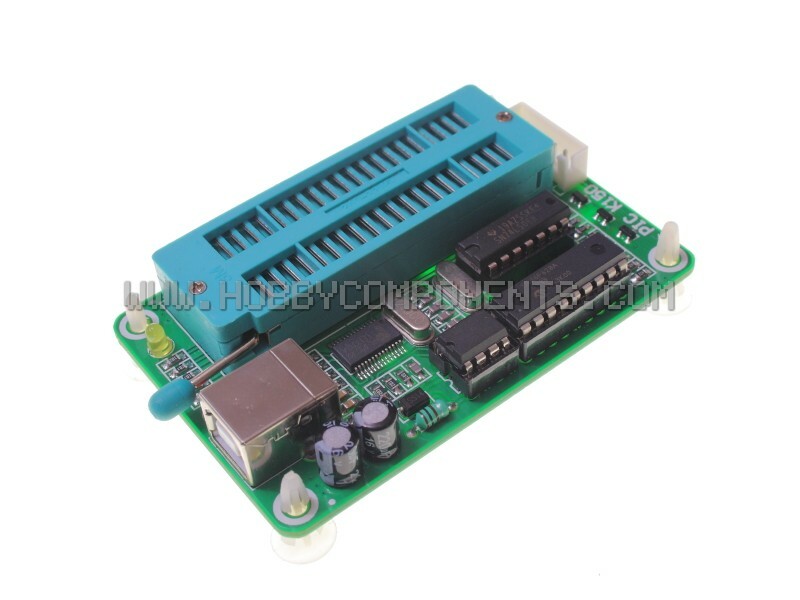 1) Download and install the appropriate driver then attach the K150 programmer. 2) Download the PIC Program Software English Version.zip zip file to your computer and then unzip it. 3) Inside the unzipped folder you will see the microbrn software called microbrn.exe. Double click this and the microbrn programming software should open up. 4) Set the COM port for your K150 programmer by going to File->Port and enter the COM port number in the window that opens up (you can find the COM port number from windows file manager). 6) From the main window select your PIC device from the Chip Selector drop down selection. Microbrn should then show you where on the ZIF socket (or ICSP header) you should place your PIC. 8) Finally you can upload your hex file to your PIC device by clicking the program button int he main window. When attempting to program the EEPROM of my device I get a reset error and the programmer fails to program the device. This is caused by an incorrect setting in the Pic programming software's configuration file. To fix this problem locate the file named ‘chipdata.cid’ which should be in the same folder as your microbrn software. Edit this file with a text editor and locate the setting's for your particular device. Amongst these settings you will find a value for ProgramDelay. Keep increasing this value by 10 until you are able to program your device's EEPROM. Please note that you will need to restart the software each time you edit this file. Make sure the programmer is plugged in. They will probably all say they are 'in use' but so long as you don't have any hardware attached that is currently using that particular COM port it's fine to choose it. Click OK to close the two windows and then close device manager. Unplug the programmer and reattach it. I am using Windows 8/10 and I can't get the programming software to talk to the programmer. What am I doing wrong? Currently the K150 does not work with Windows versions above Windows 7. This is due to the fact the latest versions of the Prolific USB driver no longer support the PL2303-HX version of the USB interface chip that is installed on the K150. Whereas installing an older version of the driver would normally resolve this issue, unfortunately Windows versions 8 and above will immediately update the driver to the latest and incompatible version without any notification. At the moment we not aware of a workaround for this issue however we will update this post should we find one. Update: Please see the note found at the top of this post for a solution. AMorning, sorry I don't speak English. I buy recently KT150 Pic programmer, some problems, please help me. USB port OK, chips select 16F628a, reset failed, don't recognize don't 16F628a, continue, received function not supported by this firmware version. I use MATLAB. Have you tried the software available in this forum? It is important that you use the correct version with this programmer. Bought the K150 and downloaded the software, all went well until I tried to use it. The first problem was the software does not recognise a com port above 9 so on my laptop had to change the com port to 2 - not a real problem but annoying. Now the fun really begins, after the program has loaded and the correct com port is selected it generates a reset error as per attached screen shot. Everything is connected and the program has aknowledged that it is connected to a K150 board. On my desktop PC the result is exactly the same - same error messages. If you ignore the reset failure and go on to program the chip you get the other attached screenshot error. I have tried this on both my laptop running Win7 and the Desktop running XP service pack 3. A new 16F628A was used for each machine. I can't seem to locate you on our system. Did you purchase this board from us? If so please post or PM me your order number. Purchased on the 18th, delivered this morning. Works on my Pc . Thanks, we will take one out of stock to confirm that there are no batch issues. Unfortunately we don't have 16F628A to replicate your setup, but before we suggest anything it would be helpful to try simielk's possible solution. We would be very interested to see if it works. If so we can update the first post. Thanks for the suggestion, unfortunately that is the driver I have installed on my Desktop - I downloaded it yesterday for a USB to TTL lead I had purchased for this project. I have unloaded the driver on my laptop and installed the version from the link you provided.